Former bffs Paris Hilton and Nicole Richie reunite years after their messy break-up. Now that's hot! Former Simple Life costars and BFFs Paris Hilton and Nicole Richie came together in Miami this weekend during the city's world-famous Art Basel international art show. Hilton, 32, reposted a picture of the reunion via Instagram on Friday, Dec. 6. 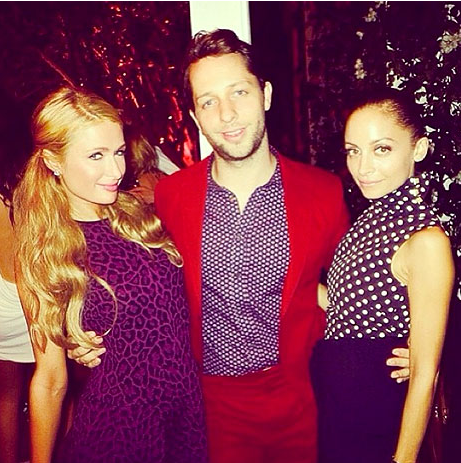 "Miami Nights with @DerekBlasberg & @NicoleRichie. #OldFriends #GoodTimes," she captioned the shot, which she credited to fashion writer Blasberg. The photo shows the blonde socialite wearing a fuschia leopard-print frock and flashing her signature smirk at the camera. Richie, 32, stands on the other side of Blasberg, in a polka-dot top and black skirt. This is the first time in a long time that the pals have been photographed together. The two famously had a falling-out in 2005, with Hilton telling USA Today that she and her then-costar were "no longer friends." "Nicole knows what she did, and that's all I'm ever going to say about it," she said in a statement at the time. Not long after, however, the two patched things up and resumed both their friendship and filming of their show. for a while, nicole was more popular and talked about than paris due to her drastic weight loss, but now that kim k and her klan have replaced both of them in the "famous for absolutely nothing worthwhile" category, it's no surprise they're friends again. i'm sure paris will be buddy-buddy with kim again as soon she joins the "media has-been" table. That looks like a good start.